Search for the best flight prices from Manchester to Washington. Compare prices, book today and save money with Manchester Airport. The site of multiple historic events and blockbuster films, home to iconic monuments and fascinating museums, Washington DC has almost too much to offer. Despite avoiding the hustle and bustle of New York City, holidaymakers will still be spoilt for choice in a city that has more tourist attractions than you can shake a star-spangled banner at. Washington DC was founded in 1790 and named after George Washington, the first President of the United States. 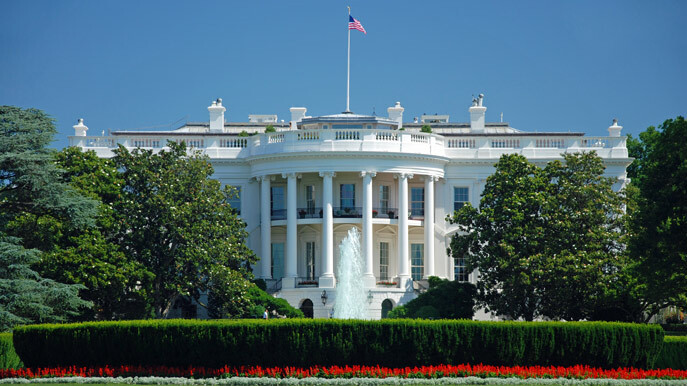 The focal point of the city is the National Mall, a landscaped park that encompasses the most recognisable of US monuments, including the Lincoln Memorial, Washington Monument, Smithsonian Museums, The Capitol Building and, of course, The White House. The Mall is one of the most popular tourist destinations in the world, and receives around 24 million visitors annually. You might be concerned about accommodation prices in the US capital, but there are more than enough excellent value places to spend the night. The Normandy Hotel, located just off Connecticut Avenue is, is only about a mile away from the main attractions of Downtown – the perfect place for those weary after a long day of seeing the sights. For somewhere with a little more backstory, why not check out the famous Watergate hotel? Once the site of major political controversy, the hotel has now undergone a hefty refurbishment that as well as being tasteful and well-facilitated, also gives a nod to the site’s scandalous past. Have your own dream in the hotel where Martin Luther King Jr wrote his famous speech; opulent The Willard Washington DC (1401 Pennsylvania Avenue) has a 200-year guest list that reads like a who’s who of international luminaries. Hotel Helix (1430 Rhode Island Avenue) is a groovy little boutique choice with an excellent location and competitive rates. Budget accommodations are scarce, although mid-range Victorian mansion Morrison Clark Inn (1015 L Street) is good, and there are a few hostels, such as downtown Capital View (301 I Street). Washington has a wide range of shopping options, so whether you’re looking for quirky boutiques and knickknacks, stylish artisan products or more designer brand clothing, you can be sure to find somewhere to suit your needs. As well as its quaint aesthetic and reasonably close proximity to the Mall, Georgetown offers an eclectic mix of indie shops and outlets to peruse. On the other hand, if brands are what you’re after, then head down to the Tanger Outlet store at National Harbour for all your favourite premium brands. The store is located just a 15-20-minute drive from the Capitol. Washington has great food, the greatest food there is. From breakfast burritos, to beer and bison burgers, buffalo wings and steaks, everyone is catered for. If you’re feeling fancy, then why not pop in to try the District Ditlling Co., a casually sophisticated venue with a reputation for good food. As the name suggests, the bar also distils its own liquor, and is stocked with a wide selection of spirits, craft ales and wines. On the other hand, if you’re after some more ‘traditional’ American grub then grab a table at Ted’s Bulletin. Crowd favourites include the ‘Peanut Butter Bacon burger’, ‘Walk of Shame’ burrito as well as home-made pop tarts. Many restaurants now have their own organic herb and veggie gardens, such as the fancy Four Seasons Hotel’s Bourbon Steak (2800 Pennsylvania Avenue), Founding Farmers (1924 Pennsylvania Avenue) and wind-energy-run Sweetgreen (3333 M Street). To mingle with VIPs on the campaign trail, try the little old pub by the White House, the Old Ebbitt Grill (675 15th Street). For a real treat, try the beautifully crafted dishes at Komi (1509 17th Street) – the service is fantastic and the food is superb. There is literally always something going on in Washington, depending on what time of year you choose to visit. Big annual events include; the ten-day Chinese New Year celebrations, Black History Month, birthday celebrations of all the Founding Fathers and the National Christmas tree and Menorah lightings. All these offer a host of events across the city, from street performances and food stalls, to art exhibitions and cultural programs. Every year, the president and his family take part in some traditional Easter celebrations on the White House Lawn, including music, storytelling, a visit from the Easter bunny and, of course, some Easter egg rolling. In 1912, Japan gifted 3,000 dreamy cherry blossom trees to Washington. Mirroring the cherry blossom festival in Japan, this two-week celebration includes a big carnival parade complete with floats and marching bands. As well as honouring its war heroes with a big parade and wreath-laying, Washington lays on a free concert on the West Lawn of the Capitol, family events and hosts the Rolling Thunder Motorcycle Rally. This annual cultural feast focuses on different national and world cultures each year. The two-week festivities take place outdoors on the National Mall and include music, art, performances, crafts, cookery, storytelling, dance and other traditions. Witness US patriotic fervour at its most intense. The national capital lays on an Independence Day parade in the morning, followed by concerts on the National Mall and an almighty fireworks show beside the Washington Monument.